Kibbeh Nayeh, tartare of Lebanon, is specially prepared spiced raw meat with bulgur. 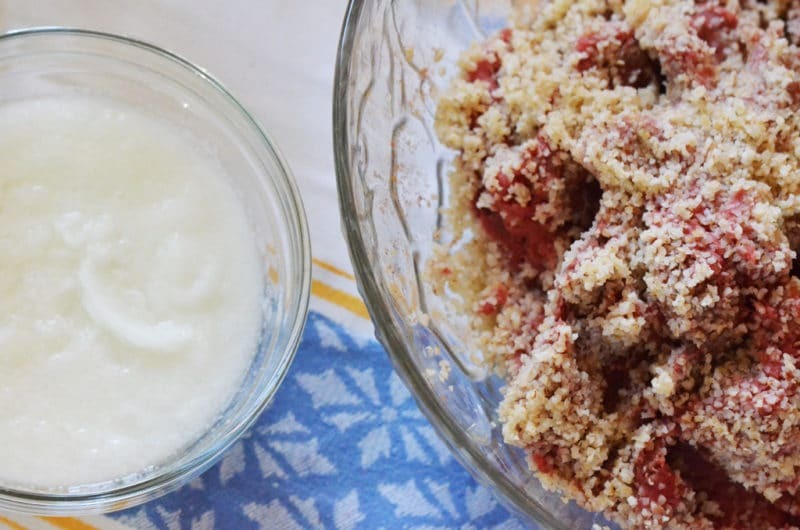 Try this beloved Lebanese dish and see how simple and delicious it is! I never knew I was eating raw meat. Or maybe it was just that I didn’t think that “raw” was something worth noting. I simply knew it was good, and that it was among a short list of dishes that my father, Camille, made an appearance in the kitchen to make rather than to just eat. He loved to describe his kibbeh-making method to an audience, usually his wife and five children, just as they plunged their pita bread into the mounds on their plates. My father and his siblings—Helen and Hilda, Hannibal, Fredric, and Richard—grew up with a mother who named them for greatness, and she must have decided that even in her humble Lebanese house, greatness would eat well. She and her daughters made at least three different main dishes for supper, since the boys all had different ideas about what sounded good. That she indulged these varied tastes would dismay anyone who tries to put dinner on the table each night. 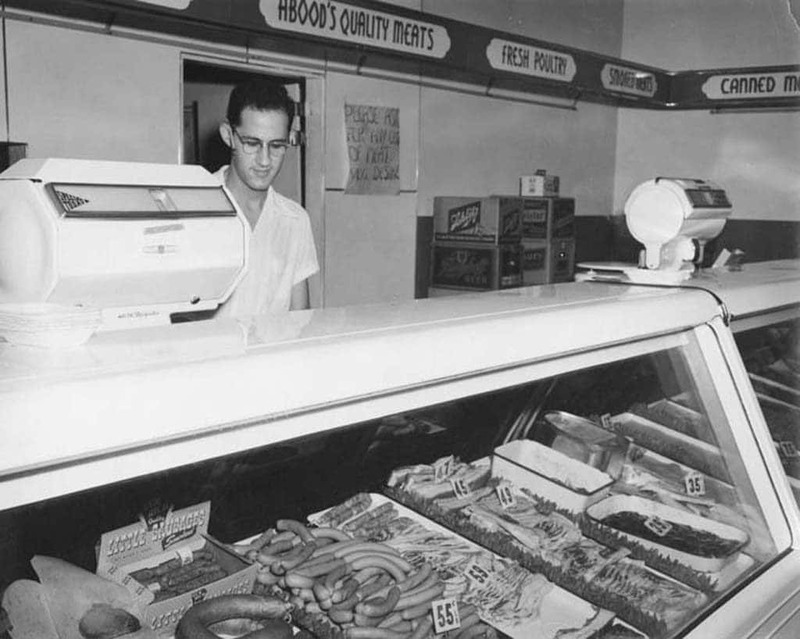 My father and his brothers gained their meat expertise at the meat counter in the family grocery, Abood’s Foods. They tasted the meat raw to be certain it was good, with nothing to hide behind. This was not unlike their approach in life as well. So it was there that Dad’s craving for raw meat was born, along with his desire to manage all things meat-related in his own household. This photo is of my Uncle Hannibal, ready to take your order back in the day. To make his kibbeh, Dad would go into the kitchen and roll his white dress-shirt sleeves up above the elbows, washing his hands like the surgeon his son would become. My mother happily became my father’s sous-chef when he came into the kitchen to cook; she placed the tunjura, an enormous bowl, on the counter and pureed the onion. When my father took the meat from their butcher’s paper, he tasted it. He did this with virtually all red meat brought into the house. He especially liked to take a piece of tender raw lamb, salt it and tuck it into a thin piece of pita bread with a slice of sweet onion. “You die and go to heaven,” he said. My mouth waters to think of my father eating a piece of raw meat and onion, smacking his full lips together as he chewed and swallowed big. To prepare the raw kibbeh, the bulghur must first be rinsed and soaked with cold water. “Fine grade bulghur is what you want,” my father instructed, referring to the size of the cracked wheat granules. Even when I was a small child, he talked to me as though I’d be making the kibbeh that afternoon and had better follow his instructions carefully. Mixing the kibbeh is much like kneading dough. I wrote a poem in college about making kibbeh, describing how one pulls and pushes the meat together until it is combined. We had to read our work aloud to the class and I when I did, another student asked me, in front of the class, if I’d make kibbeh with him over the weekend. And he wasn’t talking about food. My father would have been proud if he’d known that I had no idea that there was innuendo of that sort in my poem. All I could say amid the roar of my classmates once I realized what I’d done was that Lebanese cooking is a sensual experience, and apparently one cannot do it well without tapping into some primal impulses. And no, there would not be a kibbeh-making date over the weekend. Combine your bulgur and meat, and add measures of pureed onion and a little cold water. Salt, pepper, cinnamon, a pinch or two of cayenne: proper balance of seasoning is essential to good kibbeh. “There is no measuring the spice,” my father said. “You add a little at a time, then taste it and add a little more.” He’d make an arous as he kneaded the meat, a small bite of the kibbeh held on the fingertips, and hand a bite to everyone in the house to taste. We all weighed in. More salt, more cinnamon, one more taste, perfect. 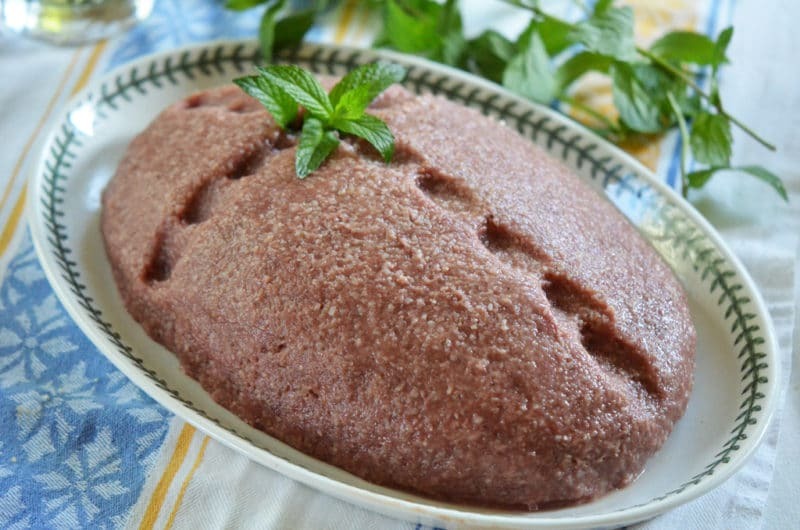 Kibbeh Nayeh, tartare of Lebanon, is specially prepared spiced raw meat with bulgur. The ratio of cracked wheat to meat is 1:1, so you can adjust quantities easily. I always make much more raw kibbeh than we are going to eat because I want to bake or fry it the next day. This recipe is for a manageable 2 pounds of meat, but I make as much as 5 pounds to provide for day 2 of kibbeh-love. The meat is ideally ground by a knowledgable butcher; technique to grind it yourself is below. If you want to bake the kibbeh, that recipe is here. To fry it into stuffed footballs, here. Rinse the bulghur in cold water, drain, and cover to 1⁄2 inch with cold water. Soak for 1⁄2 hour, or until the bulghur is softened. Either ask the butcher to grind the meat for you (three times on sterile blades), or grind it yourself. To grind meat, slice the trimmed meat into rectangles, about 4x2 inches. Season lightly with salt and pepper and freeze for 30 minutes. Grind the meat once on the fine/small holes on the grinder, or twice on the large holes. To combine the kibbeh meat, keep a small bowl of ice water nearby to keep hands wet and cold. In a large bowl, knead the meat with the pureed onion and about half of the cracked wheat. If there is any visible water left in the cracked wheat from soaking, squeeze it out of the wheat before adding it to the kibbeh. Dip hands in water as you knead, adding about 1⁄4 cup of the water in total; be careful not to add too much water to the kibbeh or it will become mushy rather than simply soft. Add the wheat 1⁄2 cup at a time until it’s fully incorporated. Season with salt, pepper, cayenne and cinnamon, tasting and adjusting the seasoning. To serve, shape traditionally, on an oval platter, form the kibbeh into an oval dome and press a cross into with the the tip of your finger, adding fresh mint for garnish (or simply flatten the kibbeh on a plate and decorate using the tip of a spoon or tines of a fork). Sweet onion, toasted pine nuts, and mint are excellent garnishes. Serve with pita bread and labneh (thickened yogurt). 84 Responses to "Kibbeh Nayeh, the raw truth"
philosophy in two brief sentences. Brava! Love your story and the photos. Your comeback story is admirable and impressive. I also has a similar upbringing in Waterville, Maine with with Sittoo and my mother who recently passed. In fact, the meat shop looks like the one that was one block from Sittoo’s home! Dad loves kibbeh nayeh so much that we rush to the restaurant when he arrives and before he leaves our home in Maryland. Keep up the good work and educating the public about our wonderful cuisine. Your family sounds very special and very familiar, Steve. Great to see you here–thanks so much and best to all of you! I too love your article! I am a WASP and married into a Lebanese family. Being from Louisiana I thought the wife to be was French. (LaHood) And soon I knew I was in a lovefest for Lebanese cooking and Kibbeh Nayeh was my favorite. My father in law was a master at preparing this dish. He was a grocer so they had a commercial meat grinder. Everything was made just like your Dad. Precious memories how they linger. How wonderful, our similar shared Lebanese family history! Thanks so much for your note! We called the sauce Humpsa it has to have tomator paste diluted with the meat, onions and pine nuts over the kibbee niyah….grandma shaker’s recipe cathy breit has it! I’ve only had it made with lamb. This will be a new experience for me. Must be similar to Steak Tartare, only better. I wish there was a good butcher in this area. I’m starting to crave it. Bill, I had some luck special ordering kibbeh meat from Tannery Creek. You might give that a whirl–let me know how it goes if you do! I’ll be heading there shortly. Thanks for the tip! I Love it! So interesting that my Dad always made the kibbee as well, Mom assisted and made the househ. I do have a hard time reading your blog before lunch, somehow my salad with chicken on top seems really boring. Lebanese fathers love to get their hands into the kibbeh! This is such a beautiful post! I’m part Lebanese (and Italian and Slovak), and some of my best memories are of making traditional food with my dad, especially kibbeh nayeh and stuffed grape leaves. 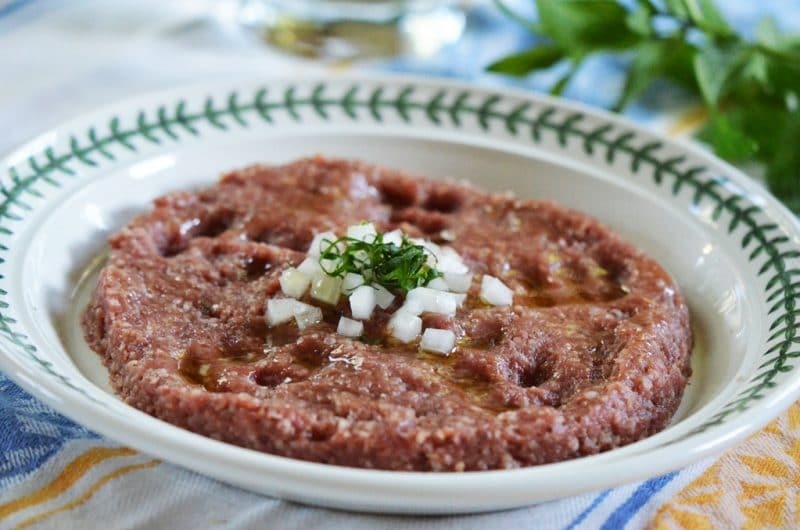 It’s been years since I ate kibbeh nayeh because my husband isn’t a fan, but I just found a source for lovely grassfed lamb that is so tender and lean and flavorful, I feel like I’m required to make a batch of kibbeh nayeh for myself. Thank you for sharing your memories and being a catalyst for me to remember mine. Melissa, how special to receive your comment! Thank you for reading and taking time to write. You lamb so spectacular and kibbeh-ready!!! Let me know if you do make some kibbeh nayeh. I wish I could come over and have some!! I’m very curious about your web site too and can’t wait to check it out. outstanding..Sometimes I will add a little chopped basil for a little different flav, I always return to the lamb with just a few of the same spices that you have articulated..I’m salivating just thinking about it now..I MAY HAVE TO QUICKLY RUN TO THE STORE !!! I have been eating Kibbeh Nayeh since I was old enough to feed myself. It beats greasy meatloaf. 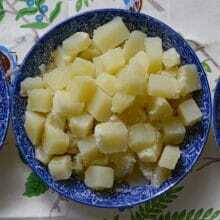 Any unused Nayeh is baked the next day and cut into squares. Goes very well with pita bread oil and your favorite beer. It is a dying tradition amoung young American Lebanese families. Because of that I have showed all of my eight grand children how to make it. My cousin Stephen Maroon sent me the link to your blog. He made a comment too. Love Kibbeh nayeh. People don’t quite understand unless they are brought up on it. thanks for sharing this! Thank you Kim! Great to hear from all of you! @Kim Maroon – Most people in the U.S. don’t quite understand because we have been taught since birth that raw meat is poisonous, remember? I was not “brought up on it” but rather “brought into it” as the American bride of a Greek-Lebanese and as a young woman who was fortunate enough to have had a mother-in-law who was a superb cook equally of both Greek and Lebanese food. My nex-husband and I have not been together now for 25 years, but I still crave Zenobi’s food, her loving touch, and her matriarchical approach to the extended family. Indeed, I still try to emulate her cooking and, much to my dismay, have never been totally successful. Now, however, after finding your blog, Maureen, I feel as though a huge part of my life has been restored to me through the gift of your recipes. I look forward to reliving the best part of that long-ago marriage! Thank you for your work and the sharing of what most people, in this country at least, were not lucky enough to be “born into” but can be lovingly “brought into” – just as you do for us in every post. As we cognocenti realize, once tasting the Lebanese cuisine, it will never be forgotten: only craved forever. Looking forward to learning from you, Maureen! Wow! Thank you so much for sharing that, JE. You have a remarkable insight about our food and culture, and I’m just delighted to know you will be here with me reviving a cuisine that has meant so much in your life. Please keep in touch! I love your expressive writing style! Its easier to write when we speak of those we love isnt it? Thank YOU, and may you one day try the delight that is (fresh, clean) raw kibbeh! Wait a second, there: it wasn’t Detroit (which has a very robust Lebanese contingent all of whom would know better than to serve store-bought raw ground beef in their kibbeh); it was in the suburbs (Macomb County) where this kibbeh atrocity took place. Just wanted to set the record straight. The best kibbeh I’ve ever had in my life was served in a restaurant in Detroit, and I wouldn’t want Detroit’s reputation for outstanding Lebanese fare to take the fall for this suburban restaurant’s gross irresponsibility. Detroit has enough problems to deal with. Bad Lebanese food is not one of them. I have never heard of Kibbeh Nayeh before and I can not grasp the fact that people eat raw meat. This sounds really interesting but I don’t think I will be trying it any time soon. I have been eating kibbeh nayeh since I met my wife as a junior in high school. I am now 66 years young. We are still preparing this at home and my adult children (3) are now making it in their homes. My wife’s father was Lebanese and his recipe was pasted down for generations. Great family tradition!!! How very special! Thanks for sharing! my wife was a 7 day advenist when we married. she was 17. did’nt know how to fry a burger. she’s 53 now and craves kibbeh nayeh. my wife and kids love cucy, luban, grape leaves, hummos, and when we were married, and cooked, or not cooked arab, there was no silverware on the table, except for the fork in the kibbeh and the spoon in the huswa. green onions, black olives, oil, and plenty of cold beer. Yella, eat. 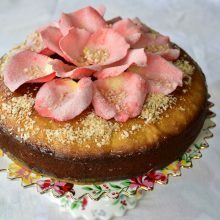 Your recipes and stories are wonderful! We just moved home to be with my Lebanese dad and at 45 years old, find myself cooking Lebanese food for the first time. I spent many days and nights with my Sitti Selway and my aunts “helping” but was only allowed to stir and taste! I have a few of their old recipes with notes but was so nervous and unsure of cooking Kibbeh Nayeh for the first time that I thought a quick check online was in order. Your website has been invaluable to me! One quick look turned into hours later and finding myself still reading your stories and recipes. Thank you for giving me (and everyone lucky enough to find you!) a place where the love and joy of the Lebanese people comes shining through with food and family. How kind, how beautiful–thank you Claire. I’m so touched to know that my site is meaningful for you and that you are making all of our wonderful foods at home with your father. Keep in touch as you keep cooking! Wonderful! My Argentine relatives use red bell pepper too–delicious! This makes me so happy! I love the way you describe making the kibbe and how everyone in the family has to taste and say what it needs to be “just right.” That’s exactly the way my dad makes it. My Sito passed away at 92 this past spring. In her honor, I’m making all the family recipes for my wine club dinner this weekend. I’m pregnant with our first (whom we’re calling Lubee until s/he is born) and I can’t wait to pass on our tradition. Lubee! That is the cutest thing I’ve ever heard! Baby will arrive knowing already the love of the Lebanese! GOOD RECIPE….only wish we had the old butcher shops. I tediously remove every tiny bit of white in my round roast (act of true love said my Lebanese grandma-in-law). I then do all the grinding very early in the morning with ice. Rule per grandma-in-law for perfect texture. I normally serve kibbeh with pita and chopped onions during cocktail hour. A 2″4″ loaf. Leftover raw meat: I roll small golf ball size burgers, flatten into a football shape.and freeze. To freeze; Put all the football shape balls on a cookie sheet- put in freezer until frozen. Put in freezer containers until needed. Fry; DO NOT DEFROST meatballs.. 1′-2″ of favorite frying oil. Place frozen kibbeh balls in room temperature oil. Bring up the heat with frozen meat and normal oil until it begins to bubble. Keep at a steady temperature.for browned meatballs. Serve with tabbouleh, yogurt or sour cream , small Lebonese tomatoe based cabbage rolls. I prefer so much more lemon and mint than I am finding in most recipes. Taste! ENJOY Lebonese food…it is so flavorful and healthy. My 4 daughters wait for the days that I have the time to cook this food as it should be cooked. Merry Xmas and a prosperous new year. Thank you for taking time to share, Chris! Interesting method for frying your kibbeh–I will try it! This is exactly how my sitty and mom make it. Your account of how your father tasted the meat reminds me of the Saturday mornings I’d go to the Eastern Market with my sitty. We’d go into the meat packing warehouses and buy a leg of lamb, along with hearts and tongue and liver… anyways, once home, we’d cut the meat sampling it along the way (raw) and skewering some of the pieces for laham mishwe that we’d cook over open flames on the stovetop. It was always sooo good. And , of course, the time spent with her learning how to cut meat and what to look for and all that…. priceless. Miss her lots.. she’s with God now teaching him the finer points of making kibbee nayeh. Thanks for the recipe and the story. How special Jim, thank you so much for sharing. You might enjoy my post about the Eastern Market here. Question: I’ve always wanted to try lamb nayeh, but don’t know which part to use. The leg? Also, I grind my own meat, so I’m thinking there seems to be a lot of gristle, fat and membranes in the leg to deal with, but I’m going to give it a try. We call the filling hashwee, and usually I use lamb meat, onions and pine nuts. but when I fry the “footballs”, I add cream cheese and lemon juice to the mixture. It is delicious! I know I’m being repetitive, but I love your site! Thanks so much Mary, and great question–the lamb does take some doing to remove all of the fat. You can use loin instead of leg. Cream cheese in the footballs sounds so wonderful and different, somewhat like adding labneh. I will try it, thank you! Rima, that’s beautiful and I’m touched that my stories are connecting you to yours. Our shared culture is an incredible gift. Many thanks. Kibbeh reminds me of French steak tare tare…but better. I am lucky to have a good middle east butcher that makes this Saturday morning. He always gives me more bulgur to mix in more if desired. He also gives me a garlic aioli. Yes you are right the stuff is very addictive. I unfortunately eat too much of it when I buy it. Also I dont think he puts mint in the recipe but I am going to ask him next time I buy some. I also have grown up eating raw kibbeh my whole life. My dad is of Syrian descent and makes it every Easter (along with the best homemade hummus in the world)- and I look forward to it weeks in advance. He seasons his with cumin and mint- I don’t believe he puts onions in the kibbeh itself. Either we top it with chopped onions cooked long and slow in butter or just olive oil. Also, I just had to point out that according to family history, our last name of Albert is an americanized version of the Syrian name Abhoud (but we have no idea how it should be spelled.) Not saying we are long lost relatives or anything, but I thought it was pretty cool a recipe for for one of my favorite mid-eastern foods in the world is written by someone who phonetically has the same last name as my grandfather before his name got the Ellis island treatment. Thanks for the beautiful story. Thinking about making this dish after the Dormition fast. Side note: What’s your favorite middle eastern restaurant in Lansing? I live in Jackson,MI and haven’t found one yet worth coming back. Hi Niki–well you know, I cook a lot when I’m in Lansing so I don’t eat Lebanese out too often. We do go to Woody’s in East Lansing and make a special trip to Habib’s and La Shish in Dearborn–I highly recommend!! Wonderful stories. My mother made kibbee nayeh regularly on Sundays. She passed on 18 years ago and since then I’ve never been able to recreate her masterpiece. I’m going to use your recipe and try and create the same great kibbee I grew up eating. I’m from Detroit and I can’t seem to find kibbee like what I ate at home anywhere. Thank you for putting this up. I love this recipe and more than that I love the way you describe it is full of love and warmth. I am from Nazareth, Palestine. I wanted to tell you that we also add Marjoram to our Kebbeh. I stumbled across your blog this morning while looking for a refernce on how much starter to milk for Laban. I am half Lebanese as my Dad was Western European. In our family, the men did not cook, sadly. My grandmother, aunt, and mother did all the cooking. My beloved Grammy was a 1st generation American, her parents coming to this country from Zahle. My Mom, and I inherited them, are impossible to decipher – mix meat and wheat to feel – making it difficult for me to figure out how much of what to use. I have my Mom but she dosen’t cook anymore due to poor health. 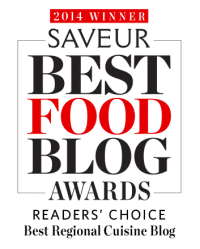 Grammy passed when I was 3 years old – I am now 49 and I realize now reading your blog that it has been 1,000 years since any of my favorite cuisine in the whole world has been made in this house. Cooking our beloved Lebanese dishes always makes me feel closer to Grammy and my Aunt Gladys, her eldest sister. My Grandfather always craved Kibbeh and Househ and my mother would make it for him, pack it in lots of dru ice and send it to him from our home in California to him in Coloraado. We never sent Kibbeh Nayeh as we were worried about it making the trip. As someone mentioned in a comment above, her husband never loved Nayeh, so when we did cook, we made never made it. Our traditional favorites have been stuffed Koosa, Kibbeh, and grape leaves. Now that I know what kind of meat to order or find I am going to have to start cooking again so my son can not only learn to love it but learn to cook it. We have a local grocery store chain here in Pheonix named Basha’s. It is owned by a Lebanese family who turned tehir small grocery business into an empire. They have an upscale speciatly store called AJ’s. The butcher counter manager at our local AJ’s prepares all the meat for the Basha family as Mike is also Lebanese. I am going to have to pay Mike a visit. I am so pleased to have found your blog! I know you did this posted 5 years ago, but I am so, so happy to have come across it! God bless and thank you! Jennifer, that’s all so beautiful! Thank you for sharing! Your family sounds very special and I’m honored to be part of your reconnection with memories and food and family. Our parents had a grocery store in Cleveland also called Abood’s Foods! LOVE kibbeh nayeh. How fantastic! Thank you Ginny! I found this when trying to find the accepted English spelling of ‘nayeh’. Non-Lebanese tend to balk at the description of the stuff… my Anglo fiance (then boyfriend) took one bite, lit up with joy, and then tore through the rest of his plate like lightning. My family agrees that’s when they decided I was allowed to marry him. You bring the best memories to mind! My dad would keep back a little bowl of kibbe nayeh for him and me when frying up a batch of kibbe for our family. I loved seeing that little bowl in the fridge! As per Chris’ post about frying frozen kibbe: I always keep my hands wet with ice water to shape my kibbe (with hushwee inside) into small, burger-shaped patties. I put them on a jelly roll pan, cover with Saran, and place the pan in the freezer until a skin of ice forms. They fry up beautifully in 350 degree oil. I use my Kitchenaid grinder to purée my yellow onion (removing excess liquid) and mix my cinnamon and salt into the onion so it blends into the meat more evenly. I grind the meat three times – the first alone, the second with the onion, and the third with the #1 wheat (soaked and squeezed dry). That, along with the light freezing, makes the smoothest, most golden kibbe! Thanks for all the inspiration!! I’m off to the market!! Thanks so much for the great tips Majla! Can’t wait to try the freezing method, as well as your grinding method! How much pepper do you use and is 1 onion enough? Yes, one sweet onion. I use a few grinds of fresh black pepper, always tasting to see what more is needed as I season! I love to make and eat Kibbeh Hayyeh! How safe is it to make it from New Zealand/Australian (previously frozen) lamb meat. Will this meat taste heavy and strong? What about American lamb meat? Is it any better or worse? Thank you. Hi Steve! The meat is really all about how it is handled, and using meat with the very least amount of fat (and trimming away what fat there may be). If the lamb has good flavor, is handled safely, and all of the fat is trimmed, it ought to be very good since kibbeh is traditionally made with lamb in Lebanon. I can’t believe I’m only just now finding this delightful site of yours! It’s like you grew up in my house (or I in yours, perhaps). 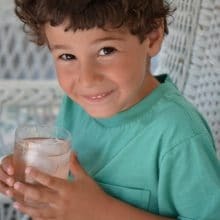 Reading these stories and seeing these recipes–so similar to my own family’s–brings back lovely memories of Lebanese food and family (“Roots!”, as my papa would say) while growing up in Indiana, where we moved to from Beirut in the 70s. I live in Chicago now, and Kibbeh Nayeh is one of my absolute favorite things. I’ve found that if I want true Lebanese food I have to make it myself. Chicago has great restaurants but not much on the Lebanese front! I hear you about the Lebanese food in Chicago! Nothing like that lack to get you cooking up a storm! Thank you for your beautiful words and blessing. God bless yours hands, too. Hi Maureen, I love your blog. I live just outside of Dearborn in Michigan. My father was Syrian and although he didn’t often cook middle eastern food for us, his sister, my Aunt did. I especially loved her kidbeh, either raw or cooked it was delicious. She always said that the hardest part was finding a good source of lamb. Both she and my father have been gone for awhile and I miss them dearly. I would love to make this dish myself, do you have any suggestions for a reliable meat market in this area? Hi Liz–thanks so much! Hmmm, I don’t buy meat in your area and haven’t studied up on the meat markets there. Maybe you can check with Beirut Bakery and ask them if they have a source they can give you. Also Greenland markets may be great for this. If you grind the meat yourself, then any good butcher can get you the top round and let him/her know you’re eating it raw. I have been eating Kibbe all my life, 74 years now. My sitto put orange peel, marjoram, and mint in her kibbe as well as cinnamon and onion. She never put cayenne pepper in her kibbe. We also put melted butter on our kibbe instead of olive oil. She also ground the meat herself with her own meat grinder. I wish I had her grinder. My friends always said I would get beef tapeworm. I would tell them I hadn’t yet and would keep on eating kibbe. Hello, Maureen. I have not posted anything for a while, but re-reading this story compels me to comment. I have fond memories of my dad grinding meat for kibbeh and other dishes, with occasional “help” from me or a sibling. My mother, not Lebanese, made excellent Lebanese food which she learned largely from my Sitoo. Mom passed 23 years ago but my dad, who just turned 93, still makes raw kibbeh and there is often some in the fridge when I visit him in Minnesota. Heavenly. My siblings and I also make this for our families from time to time. We use allspice, salt, and pepper to season. I have had it made with cumin also, and your cousin Jim several years ago ordered a pan of baked kibbeh for the office which used cayenne, which I had never before had but liked. He ordered it from a place in Michigan which I do not remember the name of; they shipped it frozen to Phoenix. In Phoenix or Mesa, good kibbeh meat (beef) can be purchased at Baiz Market. My dad has a non-Lebanese butcher in Minnesota who understands exactly what is meant when he orders kibbeh meat. I have not heard the word “fadulah” in a while but is usually not needed when any type of Lebanese food is on the table. We always enjoy your writing and your recipes. Kibbe Nayyeh was one of the first dishes I ever ate in Lebanon. It was by chance, but ever since then I have fallen deeply in love with this dish. I can not get it so often, but I have dreams about it. I have a couple of generous Lebanese friends that have surpised me with, since mentioning it to them. They are just as generous as your Aunt Hilda, making me my favorite dish. Thank you for sharing your story. It keeps the memory alive when I haven’t kibbe nayyeh in awhile. Oh how special, thank you so much for that message of food and love and joy. Your friends sound very dear, as do you. Maureen, My grandparents had a farm outside of Holt, Michigan. My sitto did all the cooking. She also had her own meat grinder. Whenever she made kibbeh all us kids would stand by the grinder waiting for a bit of raw ground beef salted and put into bread. She would then send us away. She added more spices than your father. The spices she used were cinnamon, dried mint, sweet marjoram,and a small amount of orange peel besides the salt and onion. Any kind of pepper was never used. She made her own bread. The large thin loaves, talami, but not pita bread. Wow! I am soo glad I found this post! My family is of German descent, Pennsylvanian Deutsche to be exact. But ever since Incan remember, my grandmother made this dish and my mother carried on the tradition. I never knew this was a legitimate dish, as I have never met anyone outside of my family who would ever consider eating raw meat. Somewhere along the line, the name has changed in my family as we have always pronounced us as “Kippy”. I just always grew up thinking it was something my grandmother just threw together and someone went to taste it raw and liked it and started eating it that way. I’m now 36 years old and still enjoy it and crave it often. My fiancee is totally disgusted by it, but to me it’s as normal as a slice of bread. I never knew it was an ethnic dish nor would I have guessed it was Lebanese! I’m very happy to see it’s something others have been enjoying! The only difference is see, are we add pureed garlic with the onion, and I’ve never had cinnamon in it, yet! Thank you soo much, this has validated 1 of my favorite dishes since childhood as not just “something weird” that I thought was just a family tradition! Maureen, every time I read your recipes I feel like I was brought up in your house. All of our elders have since gone and I am the Kibbeh maker in the family. As I read your recipes I close my eyes and it brings back such wonderful memories of all the ladies in the kitchen making everything under the sun. Three families all eating together for Christmas Thanksgiving Easter when I was a child. Brings wonderful happy tears to my eyes. A lot of Lebanese people immigrated to Waterville Maine and are now gone. My sisters and I hold the traditions as best as we can. I love your blog and I hope I get to meet you someday. Thank you for doing this it keeps the traditions going. How beautiful beautiful beautiful, thank you Laurie. I’m so glad you are carrying on the traditions. We’ll meet and I will look forward to that day! That is a wonderful vintage photograph of your uncle in the family grocery store. I had to smile when I saw the Stroh’s beer box in the background…as I am a native Michigander but moved away 40 years ago. Was the store located in Lansing? Is it still there? Chris, yes, Aboods Foods was in Lansing–the building still stands but the store is long gone! Thanks for noticing this wonderful photo. My Jidu would grind the meat and onions with a hand grinder and my Tita would mix the wheat, onions and lamb together. She would mark it with her hand, pour olive oil on and serve it with Syrian bread and green onions. My American mother would make it…always with lamb…and my father would share it like your father would. My father would cut up a leg of lamb to get the kibbee meat, shish kabob meat and then would find the kidneys, slice them and put them in bread with salt and pepper. That was a delicacy for my brothers and myself. Thank you for sharing so I could reminisce. Beautiful Elaine, thank you so much.